This letter is in response to a question about the place of leisure in the Christian life, and how to glorify God in all that we do. I wrestle with this very same question, and I know most Christians do as well. It can be confusing to know what it really means to glorify God in all that we do, when there are so many different ways we could conceive of that. A Muslim would think very differently about what that means than a Christian, and among Christians there are different conceptions of what this should look like. On top of that, we have our own life experiences, and we all have a sense of what is "normal" and "not normal", which differs person to person and culture to culture. It's a tricky question. It's been helpful to me to recognize that God made humans a certain way, and part of being human includes the desire and need for recreation and leisure. That is, God didn't just create humans to do nothing except work. Nor did He create humans to do nothing but sing hymns in church, or read the Bible. He created humans to do all sorts of things--to learn, to play, to enjoy, to laugh, to experience relationships, etc. So our Christian lives need to be lived in the fullness of all that God made us to be. 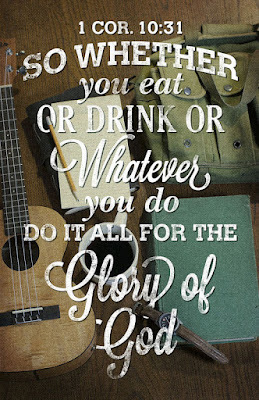 By enjoying every aspect of the way God made us, we can give God glory by simply giving Him thanks for the things we do and enjoy. In other words, you can go rollerblading and give God glory simply by recognizing that God created you to enjoy rollerblading. Go rollerblading, have a wonderful time, and thank God for it. This brings God pleasure. In fact, I am sure that gives God more pleasure than if you spent all your time witnessing to the lost but without any joy. It's not that we can't witness with joy, but if all we ever did was witness to the lost, I don't think we would have joy because we would not be actually living according to how God made us. We would feel restricted, awkward and uncomfortable. Does this mean that the apostle Paul played games? Probably he did. I don't rule it out. I'm sure he enjoyed food very much, and lived a thankful life for more than just his salvation. The balance, of course, is that there is a mission for the church. If we spend all our time rollerblading, we will be unfaithful to God. But I also think we wouldn't be joyful rollerblading all the time either, since we weren't made to only have leisure, but were also made to work, and to fulfill the mission God has given us. So living is the art of knowing when to do this and when to do that; how much to do this and how much to do that. Ecc 3:2 A time to give birth and a time to die; A time to plant and a time to uproot what is planted. Ecc 3:3 A time to kill and a time to heal; A time to tear down and a time to build up. Ecc 3:4 A time to weep and a time to laugh; A time to mourn and a time to dance. Ecc 3:5 A time to throw stones and a time to gather stones; A time to embrace and a time to shun embracing. Ecc 3:6 A time to search and a time to give up as lost; A time to keep and a time to throw away. Ecc 3:7 A time to tear apart and a time to sew together; A time to be silent and a time to speak. Ecc 3:8 A time to love and a time to hate; A time for war and a time for peace. Life is supposed to be multifaceted and multidimensional, not flat and uniform. The trick is knowing what time it is. This changes constantly even throughout one day. It really isn't always time to witness to the lost. It isn't always time to give money to the poor. It isn't always time to play games. But all these things should have a place in our lives--since that is how God made life to be. I'd encourage you to listen to this sermon that I preached at Christmastime a couple years ago. Also, you should check out the book Leisure and Spirituality by Paul Heintzman, who has spent a lifetime thinking about this question. I hope this is helpful. Thanks for asking, A--------.